Oh yes, we’re in New Orleans for four days… we’re pretty stoked. Although I must say our first full day we unintentionally surrounded ourselves with the comforts of home. Lunch consisted of Mexican food, I bought a toy made in Oaxaca, Mexico and we ended the day by going to see the San Diego based Bushwalla at the HOB, whom I’ve seen more than I’ve seen Prince. We had to laugh at ourselves for bringing a bit of our life in San Diego here, but don’t fret… I redeemed myself by having a bowl of Gumbo and we also indulged in some lovely Beignets. 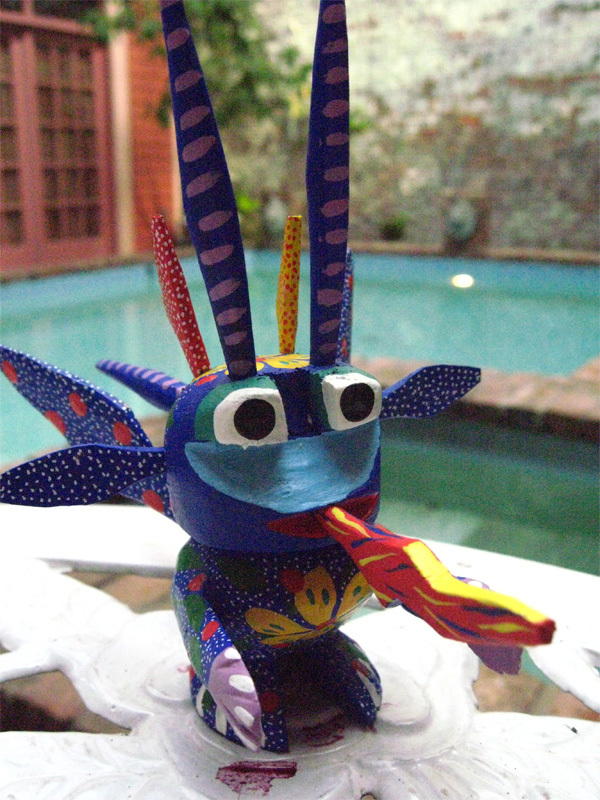 Furthermore, we have a few more days to really get the hang of this Crawfish eatin’, Jazz piping town – gladly! 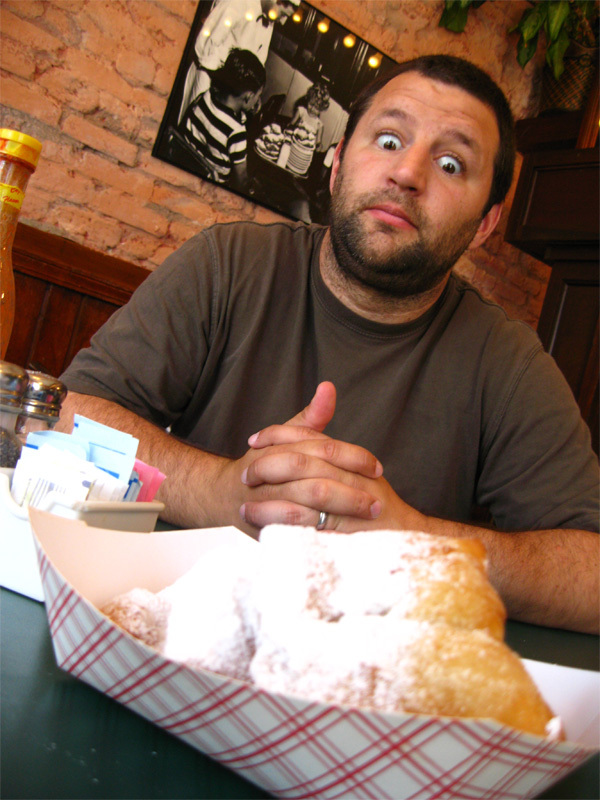 Breakfast consisted of coffee, Beignet and New Orleans style praise. It’s still quiet here being Monday and all, so we just strolled up and down the Quarter, Bourbon Street and the French Market. While in the market we met a woman selling wooden toys made in Oaxaca, Mexico. We talked about eating crickets in comparison to eating crawfish and traveling around the west. Ultimately we bought a “Boogie Man” carving that I fell in LOVE with. 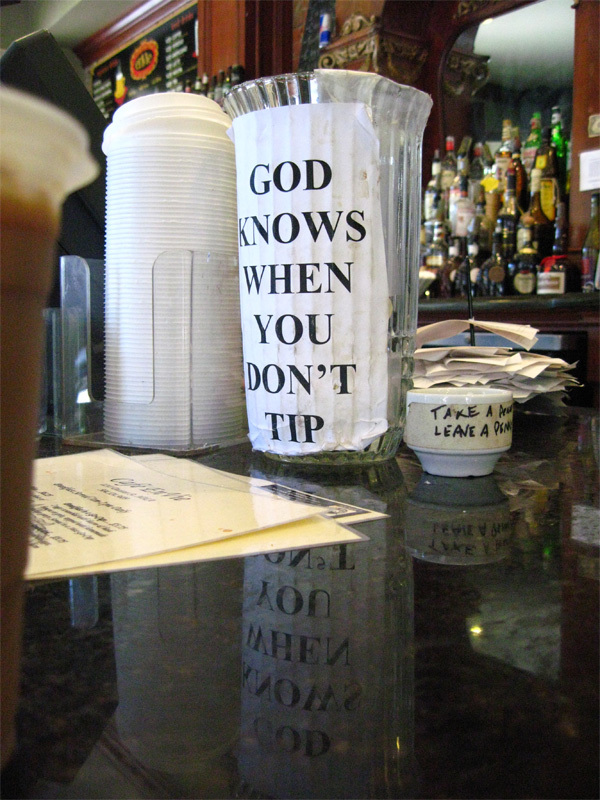 After our fruitless search we ended up at a Cuban Mexican Café near Canal Street. We had beer and sangria than ordered our lunch of Fajitas. I had the vegetarian, which was made with fried Yuca root and Maduros (fried plantains), while Dennis ordered the Pork. 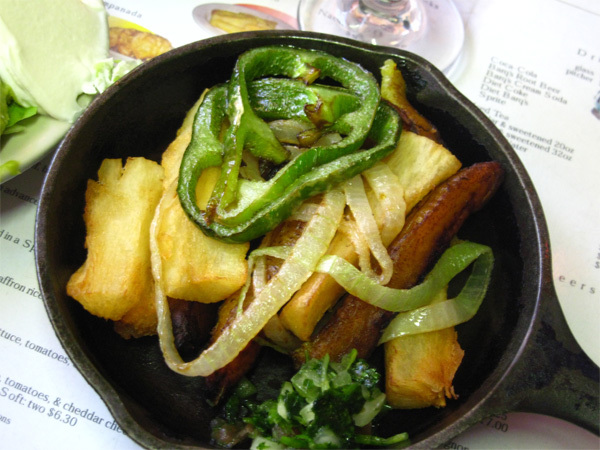 The Yuca tasted like a fried sorta-sweet potato and the Maduros was surprisingly good in as a taco! 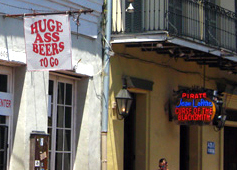 We got as far as Canal Street, which divides the “Free-Spirited” French Quarter with the CBD (Central Business District) or the American Quarter. Canal street is the widest street in America and spans over 171 feet across. We decided we would take on that “side” tomorrow. Several blocks back to our hotel we rested up for our evening with Bushwalla! We stopped for a drink and a quick bite. 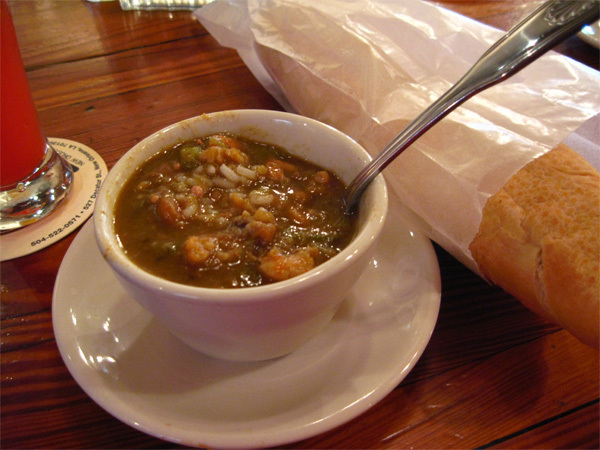 I got a bowl Gumbo and a crusty French baguette. I liked the flavor but the consistency was unexpected. It was sorta like a thickened broth or the texture of egg flower soup, I think? Anyhow… this was my redemption. 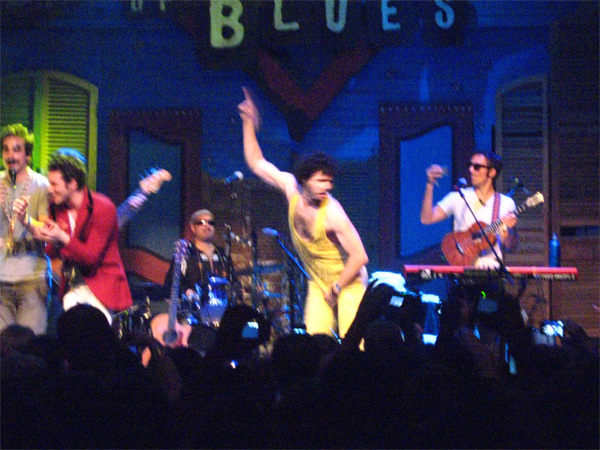 Off to the concert… upon arriving at the HOB there was Bushwalla standing out on the street. I wish now I would have said hi or got my picture with him. The show as awesome, he’s a mix master of tricks, free-style and funk-folkish flavor and Love. I can’t say enough except that if you can, go see him for yourself. I bought a t-shirt! Meandering home, we got hungry and stopped for some Panini sandwiches. Ah, what a lovely night. In the last 14 days, I’ve really enjoyed recounting the little moments and taking the time to reflect on what otherwise might be forgotten… like what we ate or funny things that were said. But today I was reminded that whether on vacation or not, each day should be held so valuable as these. A dear friend of mine lost her father today and I wanted to send my love and compassion to her and her family. « Day 13 – From Big to Bigger… the Big Easy! she says stay OUT of the dirty shops !!! she really liked the beignets too. and don’t for get to take a cruise on the mississippi river. and say hi to pres. bush for us. You two drive safe! Love you & Miss you! Thank you for your message regarding my dad and I want you both to know sharing your travel photos with me always brings a smile to my face!!! YOU TWO ARE THE BEST!!!!!!!!!!!! !